This practical, lab-based approach to nano- and microfluidics provides readers with a wealth of practical techniques, protocols, and experiments ready to be put into practice in both research and industrial settings. 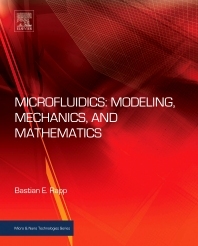 The practical approach is ideally suited to researchers and R&D staff in industry; additionally the interdisciplinary approach to the science of nano- and microfluidics enables readers from a range of different academic disciplines to broaden their understanding. Dr Rapp fully engages with the multidisciplinary nature of the subject. Alongside traditional fluid/transport topics, there is a wealth of coverage of materials and manufacturing techniques, chemical modification/surface functionalization, biochemical analysis, and the biosensors involved. A set of hands-on experiments and protocols that will help setting up lab experiments but which will also allow a quick start into practical work. A collection of microfluidic structures, with 3D-CAD and image data that can be used directly (files provided on a companion website). Dr Bastian Rapp is currently emplyed as Head of Group at the Karlsruhe Institute of Technology (KIT), Institute of Microstructure Technology (IMT).